Her Knight Dance 2019 *Tickets on Sale Dec. 1st! 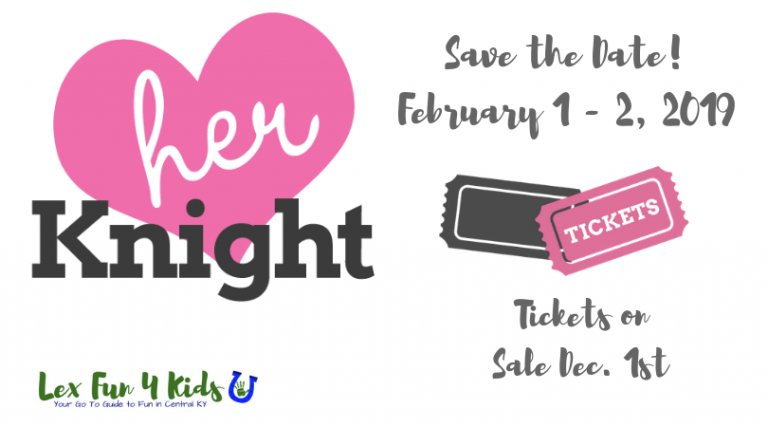 The 2019 Her Knight father/daughter dance will be: Friday, February 1, 2019 and Saturday, February 2, at Keeneland’s Keene Barn & Entertainment Center. 2019 Her Knight Dance ticket sales will begin at 10 AM on PINK SATURDAY – Saturday, Dec. 1, 2018! Last year’s tickets sold out in less than 24 hours, so grab your tickets quickly! Once they’re gone, they’re gone! TICKETS: $60 for one dad/knight and up to 2 daughters/princesses and $20 for each additional daughter/princess. All tickets include dancing, food from Chick-fil-A, a professional photograph that you can download & print after the event and a keepsake favor for the girls. Each father/knight attending must purchase a ticket. There will be 5 sessions to choose from at the 2019 Her Knight Dance. The early sessions are recommended for younger girls, but all sessions are open to girls age 4 -12. Each Dance Ticket covers one father/knight and up to two daughters/princesses ($60), for each additional daughter/princess, an Extra Daughter Ticket must be purchased for $20 each. All tickets include dancing, food from Chick-fil-A, a professional photograph that you can download & print after the event and a keepsake favor for the girls. Each father/knight attending must purchase a ticket. Tickets cancellations submitted to Her Knight Dance, Inc. by email no more than 30 days out from the date of the event will receive a full refund less a $5 processing fee. No refunds will be given less than 30 days out from the event. Tickets are not transferable unless otherwise determined by the administration of Her Knight. For the safety of all attendees, individuals not listed on the master attendee roster will not be admitted into the dance. Reselling of tickets is strictly prohibited. What time & where is the event? The 2019 Her Knight Dance will be held Friday, February 1 & Saturday, February 2. For the 2019 dance, there will be five sessions to choose from. Early sessions are recommended for younger girls, but all sessions are open to girls age 4 -12. All sessions take place at Keeneland’s Keene Barn & Entertainment Center. Why did the age range change to ages 4-12? The recommended age has been adjusted from 2-12 years old to 4-12 years old for the 2019 Her Knight Dance. Our goal is for every knight to have a successful evening with his princess(es). It’s been our experience over the years that four seems to be the magic age when the dance “clicks” with the girls – attention spans are longer, potty training is complete and many are more comfortable in a larger crowd. This is simply our age recommendation and families are encouraged to do what they feel is best for their individual situation. What if a girl’s father can’t bring her? Her Knight is open to stepfathers, grandfathers, uncles, godfathers or other male role models who fulfill the role of ‘knight’ to a little girl. Can mom or family members come take photos? This night is dedicated to our fathers/knights and their girls, therefore we keep this special time reserved only for them. We have hired multiple professional photographers to be at our event to take both posed and candid photographs from the evening so you won’t miss a thing. Just be sure your knights and daughters know to smile when the camera comes around! Our knights are also welcome to bring their own cameras to take pictures at the event. There is no official dress code. We want everyone to be comfortable. However, many girls enjoy wearing party dresses to the event. The attire for fathers/knights ranges from khakis and dress shirts to suits and even a few tuxedos and military uniforms. Complimentary dresses are available for any girl with a financial need. Please contact us for more information. Who holds the event? Who does it benefit? Her Knight Dance, Inc. is an independent, 501(c)3 non-profit organization which is comprised entirely of unpaid volunteers. A portion of the proceeds from ticket sales benefit non-profit, charitable organizations that support and encourage fathers and/or daughters. Since our inception in 2011, Her Knight has given more than $140,000 in charitable donations to deserving community organizations. What type of food is served? What should I do if my child has food allergies? Chick-fil-A generously donates the food for our guests. The menu includes a variety of Chick-fil-A favorites, including Chick-fil-A nuggets, sandwiches, fruit, waffle chips and dessert items. Many families enjoy going to a restaurant before the event to make the evening even more special. However, everyone is welcome to eat at the event. Please review Chick-fil-A’s Allergen Information for more details. If your child is allergic to the food offered, it may be more convenient for you to eat before or after the event. We will make every effort to accommodate special requests due to food allergies. Please contact us with special requests. What is the Her Knight Scholarship Closet? This is a party and we want every girl to have a special party dress to wear! A limited assortment of party dresses are available to attendees who need a dress for Her Knight. To request a dress for an attendee or to donate a gently used dress to the Her Knight scholarship closet, please contact us. How do I nominate someone for a scholarship ticket to the dance? Each year, Her Knight dedicates 10% of tickets sold to scholarship recipients. Scholarships are distributed to qualified nominees. Nominations for the 2019 dance are now closed.